A couple Saturdays ago, I went down to buy my pass in preparation for our trip, and decided we might as well go through the museum while we are there. I rounded up my two little ones and a couple of little friends, and headed on into Turtle Bay Exploration Park. It has probably been a good 3 years since I took my kids to Turtle Bay. As my big kids had grown, they got tired of it. So we just stopped going. My daughter is obsessed with gift shops. She is always on the look out for something to buy! This shop is really cute, with a nice coffee bar inside. There are lots of unique gifts. I bought these great California decals. I do really love the architecture of the museum. It is a beautiful building. The permanent exhibits have been updated slightly, for instance, they have added a Beaver and ducks to the large fish tank. The beaver was really fun to watch! I couldn't get a good picture of it. Bummer. The museum has rotating exhibits. Right how the main exhibit is Rock U: The Institute of Rock 'N' Roll Exhibit at Turtle Bay. I'll do another post on this later, but my kids spent a lot of time in there! They loved it. However, if you have a headache, don't go in there! Haha! It will make it worse. There are tons of instruments for the kids to play on! 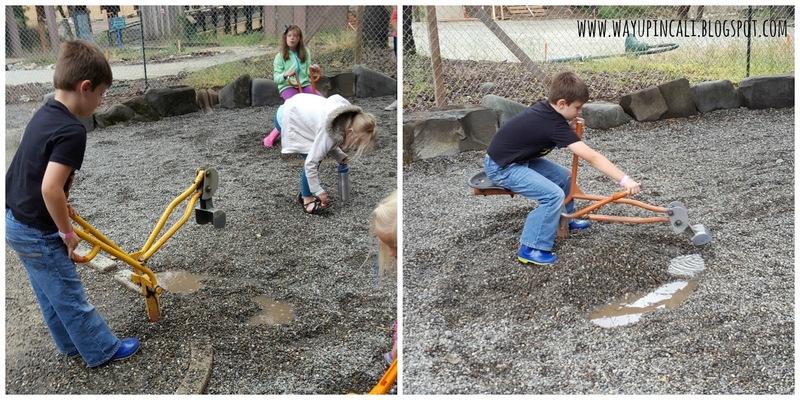 Of course the kids needed to stop and play in the gravel! They are never too big for a good dig! (We did however for-go the water area as were were there on a rainy day.) Then on to Paul Bunyan house to see the reptiles. 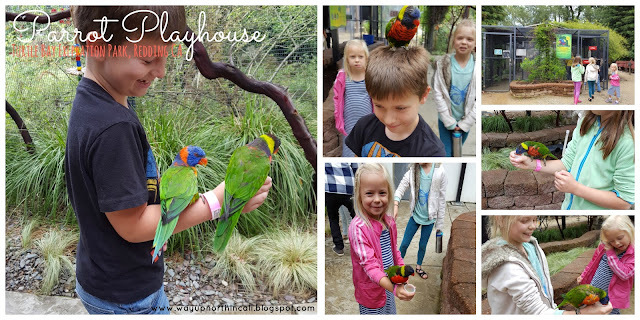 We visited the Parrot Playhouse. It is free with admission however, $1 gets you a cup of nectar to hold out for the birds to feed from. Just do it. It's worth the $1. 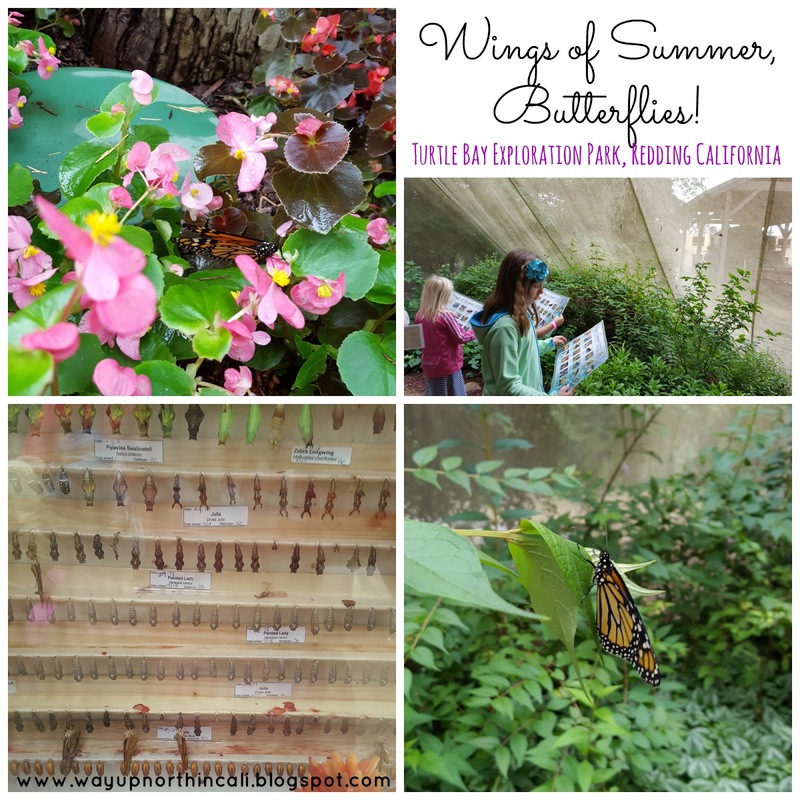 Next was the "Wings of Summer, Butterflies!" exhibit. We went on a rainy, cloudy day, so they butterflies were not as active as usual, but it was still fun to walk through. One thing that has changed about Turtle Bay since we have been is the new area for the animals. I really liked this. Their habitats were much larger than they used to be. We saw porcupine, skunk (What they heck! Why do they have a skunk!? 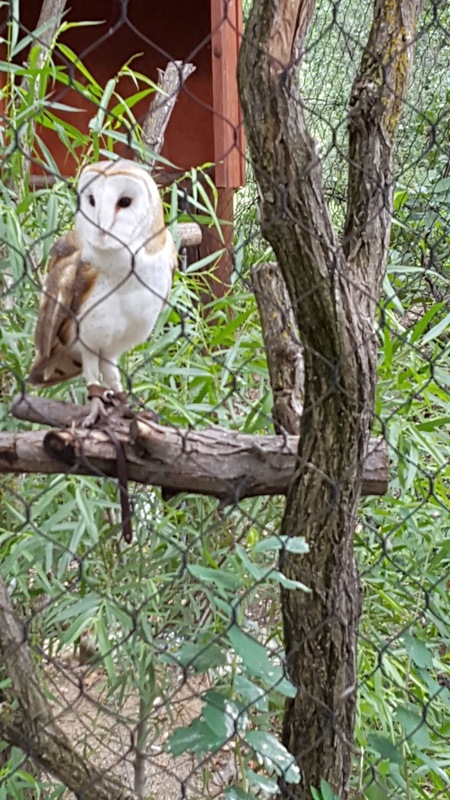 ), fox, owl, eagle, turkey vulture and more. Like I said, there is some construction going on with the building of the new hotel, so the playground is gone, but with plans to put in a new one soon. 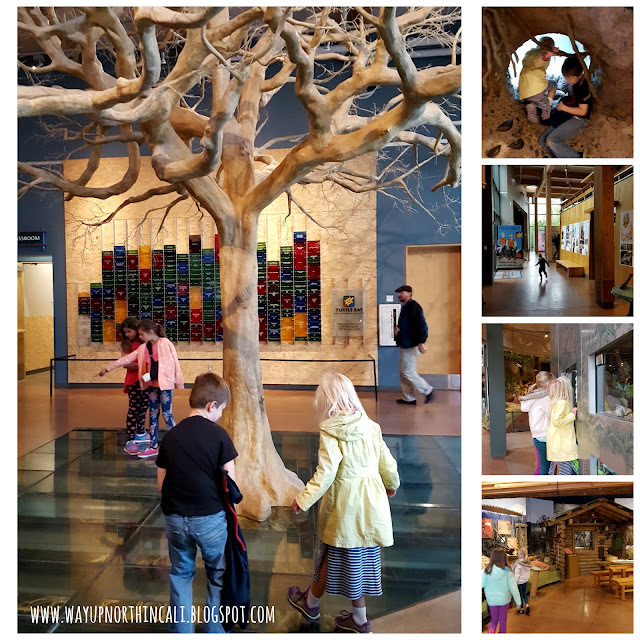 Redding is so blessed to have this great Museum, Arboretum, Park and Sundial Bridge, all connected to the river trail. It really is a fantastic place to take your family and enjoy the day. 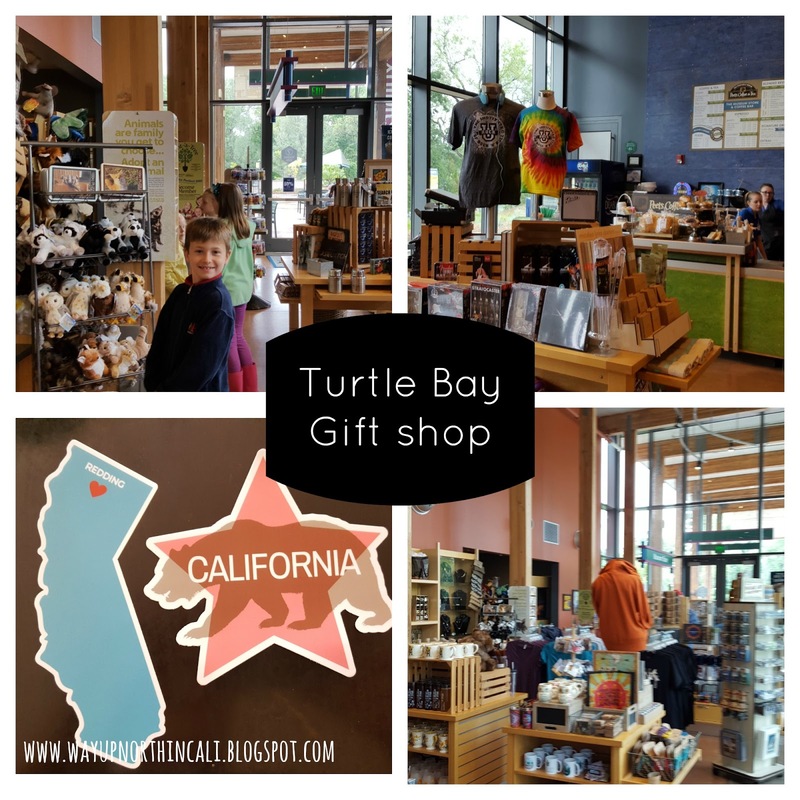 What do you like best about the Turtle Bay area? Is the lumberjack/gold panning water area still there? The kids could spend hours playing there! Yes it is! My kids love that area, but it was raining so we didn't do it this time. When it's hot, we will do it for sure!